Inside the darkened gallery space is a calming, colorful array of work by Bay Area–based Cork Marcheschi, all aglow. This exhibition, “Cabinet of Curiosities” (on view through February 26) is a mini-retrospective for the artist, who has been working in the medium of light since 1968. Many of the works are recent or current (2009–2011); they are interspersed with pieces going back to 1969. Along the way, we see clear shifts in style and interest as Marcheschi investigated the breadth of his chosen medium. None of the pieces flash or move — at least not without human interaction. The 1975 Oasis creates a sizzling electrical current when a pedal is pushed, and Jujubees (1970–1990) gently reacts to touch with increasing intensity of light. The overall effect is quiet and meditative; it comes as no surprise that the artist is a longtime practitioner of Zen Buddhism, which he studied under Alan Watts. 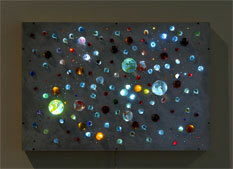 Several current works utilize colored marbles fit snugly in holes cut out of an aluminum box; the light from inside the box shines through the marbles to create a soft glow. With titles such as Position of the Stars the Night Lenny Bruce Died (2010) and Constellation #1 (2009), there are clear references to starry skies, which several of these works resemble. The use of marbles evokes memories of childhood. Light is also used to commemorate those who have passed. Two of the most recent pieces are memorials to the artist’s dog Ruby. Blues for Max (1992), a child’s chair that stands on lightbulbs to produce a ghostly glow, as well as the two neon squares, Mantle Paratrooper’s Last Jump: Goodbye Uncle Buddy, 13 and 14 (both 1980) commemorate people now deceased. 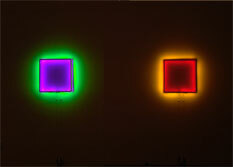 Marcheschi’s style has ranged from color-casting minimalist geometric neon work that calls to mind Dan Flavin, to complex, funky and funny pieces. The latter label fits a work of backlit steel that has been plasma cut with lively cartoony images whose shadows dance chaotically on the wall, recalling William T. Wiley and H. C. Westermann. Such references there may be, but this is an artist who, ultimately, is doing his own thing. That thing is by turns playful, sad, inspirational, and peaceful. Light can do all that. 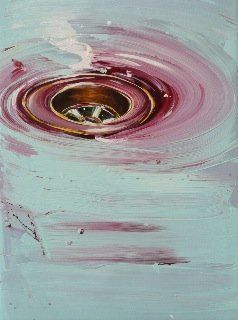 The immediate impression of “EINFLUSS: 8 from Düsseldorf” (on view through February 5, 2011) is, wow, these artists can paint! Save the two works by artist Luka Fineisen, a sculpture and a gestural wall piece, both made with plastics, all of the other twenty-seven, mostly large-scale works in the exhibition are paintings, and there’s something wonderful to be found in every one of them. As the show’s title indicates, eight artists are represented: Bernard Lokai, Jutta Haeckel, Driss Ouadahi, Birgit Jensen, Cornelius Völker, Stefan Kürten, Stefan Ettlinger, and Fineisen. The artists all studied at the Kunstakademie in Düsseldorf, well known as one of the most influential art schools in the world. The list of artists who have studied or taught there reads like an A-list of contemporary art: Gerhard Richter, Joseph Beuys, Bernd and Hilla Becher, Andreas Gursky, Thomas Struth, Katharina Fritsch, Anselm Kiefer, and Sigmar Polke, to name only a handful. And if there’s a singular thread to be noticed throughout the work of all artists who have ties to Kunstakademie, including the eight in this show, it’s a rigorous training in both art history and formal artistic pursuits. 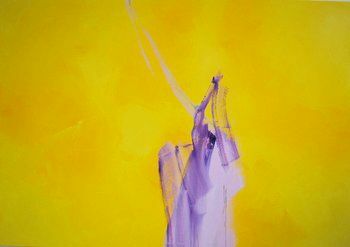 Stepping into the gallery, you are immediately grabbed by Lokai’s bright abstract work, “Ohne Titel.” The painting features a bold yellow background that subtly varies in intensity and purple/lavender brushstrokes concentrated in a tall, rather thin triangular form with its base at bottom mid-canvas and the apex ending about three-fourths of the way up, a light gesture that veers off the top of the picture. It is a work of economic movement and elegance. Lokai’s two additional works in the show — to be fair, one of the pieces, “Landschaftsblock S (Landscape Block S),” is actually comprised of eighteen small canvases, each a study in the exploration of that space between representation and total abstraction — are equally engaging. Evident is the influence, though not overbearingly so, of Richter, under whom Lokai studied. Cornelius Völker, "Sink - 4"
Exhibiting a love of paint’s lusciousness is Völker, whose two paintings of sink drains and six guinea-pig works — Völker works in series, fully immersing himself in whatever he’s focused his brush on — are as much about their subjects as they are about celebrating the medium. Thick, brushy strokes blend and swish the color about. The drains swirl with life, the guinea pigs become almost abstractions of delightfully colorful, moppy hair. Ouadahi combines a strong sense of architecture with emotion. In “Vis à vis,” layers of beautifully painted grids may be read as outlines of high-rises being built, or the aftermath of destruction. The viewing experience sets you apart from the city. A barrier is also present in “Fences Hole,” in which a gorgeous, Impressionist-style dusky sky is obscured by a photorealistic painting of a chain-link fence with a ragged hole in it. There is a sad and lonely feels to these pieces that is only heightened by their beauty. There are textural, layered pieces by Jutta Haeckel; Birgit Jensen’s explorations of imagery, monuments, and patterns; Stefan Kürten’s nostalgic, historically complex paintings; and Stefan Ettlinger’s livelyl narrative scenes in egg tempura and oil on canvas. Throughout there is attention to process, technique, and individual vision that combine to truly satisfying effect. This is a well-chosen glimpse into what remains one of the most vibrant art scenes in the world.